For those not in the know, Wayfair is an online outfit selling furniture and other household items. Both the cloth and rectangular plate featured in the photographs came from this establishment. The blueberry blondies, inspired by these raspberry blondies I made last year, are sweet and squidgy with a beautiful colour as well as flavour from the blueberries. The addition of lemon zest gives a delightful citrus zing. The piece de resistance, however, is the white chocolate which caramelises whilst cooking giving a crunchy and very tasty crust. To see my recipe and step-by-step photos for caramelised blueberry blondies, head over to the Inspiration pages on Wayfair. I’m sending these off to Recipe of the Week with Emily at A Mummy Too. Oh, those look amazing!!! Thank you for linking to my blondies as well. Thanks Margot, your blondes sound well worth trying. These sound delicious! I love blueberries but never thought to put them with white chocolate, will have to try! Thanks Sophie. white chocolate goes well with most fruit I find – it’s the vanilla notes. These look fantastic. You’re right, white chocolate and blueberry is a fantastic combination (though I am biased as white chocolate is my favourite type of chocolate…) I’ve never made blondies before though. These look quite straightforward so I’ll definitely be bookmarking these! Hehe Emma, it is a bit addictive and they do have some very nice stuff. If you like white chocolate, then blondies are definitely for you. pretty blondies and pretty plates… I think I’d like both in my home please. Ah thanks Dom. Sugar and spice and all things nice – it’s just too hard to give up on baking. Ooooh yummy… These look absolutely gorgeous! I love blueberries but have never baked with them. Well Paul Hollywood would disapprove as they bleed into everything, but I like that. A classic blueberry muffin is a good place to start and adding lemon to them brings out the flavour and stops them being too sweet too. 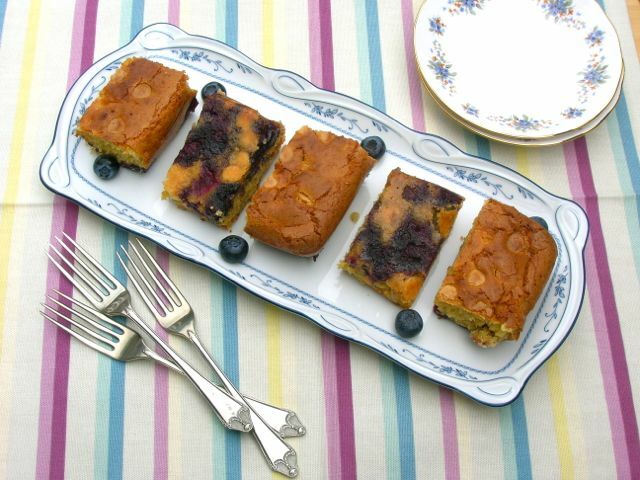 These blondies with blueberries and caramelised white chocolate sound and look so very inviting! These look fantastic, Choclette. I wish I could grab one through my laptop screen! Thank you Manu. Blueberries are a lovely fruit and baked along with lemon, they are even better I find. Gorgeous! I don’t really like white chocolate much usually but these look wonderful and I love the sound of the caramelised crunchy top on these squidgy delights! Thanks Katharine. I’m not a fan of eating white chocolate on it’s own, I find it far too sweet, but I do love it in baking. Thanks Janice. It certainly worked well with raspberries, but it has yet to be tried with anything else. I love how blueberries bake and go all squishy – these look divine! Thanks CC. There’s a lot of nonsense talked about fruit bleeding into cake batters. That’s what makes them even more appealing, surely! I’ve never met a blondie I didn’t love! love the rectangular plate. Blueberries, white chocolate and lemon combination cannot get more tempting. Thanks Mayuri. I was really pleased with the plate, it makes more sense than a round plate for lots of things. thes blondies look Delish!! Worth a try. I love blueberries . Thanks for sharing. You had me at CARAMELIZED. Which is equal to EPIC WIN! These blondies are bombshells, that’s for sure. Thanks for sharing this lovely recipe! They are cute and healthy.. Presentation is very good..
White chocolate and berries has to be one of my most frequent kitchen pairings! I bet these blondes were so good… I can almost taste them from here! I’ve never made a blondie but these are seriously tempting to me to get my blondie on! Go get your blondie on Kavey. The beauty of baking with blueberries, is that they are easily available all year around.